He said Chileans were rebelling against against ‘excessive inequality’ in a country that has the highest per capita income in Latin America but also has one of the most unequal distributions of wealth in the region. Mr. Piñera has called those inequalities ‘immoral,’ but has also shown impatience with the protesters, saying recently that ‘there is a limit to everything. Protesters have been creative. A relay of joggers was trying to complete 1,800 laps around La Moneda, the presidential palace, to symbolize the US$ 1.8 billion a year that protesters are demanding for Chile’s public education system. Others have held a mass kiss in, dressed like superheroes, danced as zombies to Michael Jackson’s ‘Thriller’ and even staged fake group suicides. Segments of society that had been seen as politically apathetic, particularly the youth, have taken an unusually confrontational stance toward the government and business elite demanding changes in education, transportation and energy policy. On August 4, high school and college students clashed with the police, who used water cannons and tear gas to disperse demonstrators. People banged pots and pans outside their homes in support of the student movement and decrying police repression. By nightfall, tear gas blanketed pockets of Santiago, more than 500 people had been arrested, about half in the capital, and more than a dozen police officers and protesters had been injured. General Pinochet decreed a system in 1981 that encouraged the development of private, for profit universities, which has led to high levels of student debt. Before the Pinochet decree, there were eight state financed universities and fewer than 150,000 university students in Chile. 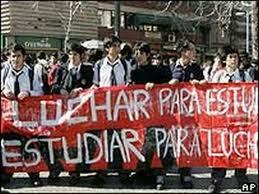 Today there are 1.1 million students in Chilean universities, in a country of about 17 million people. More students are in private colleges than in public ones. “For many years our parent’s generation was afraid to demonstrate, to complain, thinking it was better to conform to what was going on,” said Camila Vallejos, the leader of the student group. Johanna Choapa and Maura Roque, both 17 and students, who had been on an all liquid diet for 11 days because of a legitimate demand. They’re setting an example without the fear their parents had, sat in front of the stage in a chilly school auditorium and asked more than 300 parents and teachers to continue supporting their hunger strike aimed at pressuring the government to reform Chile’s education system.